I always like when I see some new device that looks like it has been plucked from some speculative fiction. The Rocketskates look like something I would see if The Jetsons was a bit more realistic. The Rocketskates have a lot of good things going for them. 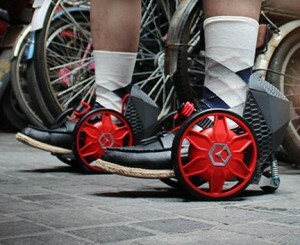 First of all, they are motorized skates. They each have a 50W DC hub motor, an integrated microprocessor, and a small lithium-ion battery pack. They can travel up to 12 miles per hour, but I don’t know if that is downhill or uphill. Here is another bonus: these Rocketskates can fit over a regular pair of shoes. I have seen similar products like this, but anything that makes skates easier to put on is fine by me. Not that I am in to skating right now, but anything that makes a fun activity easier to prepare for is also fine by me. I also heard this other feature it has that allows for wireless control via smartphone. I believe that there is even a camera on one of these Rocketskates so you can have a skate roam the world. I think there is even an app so you can connect to other Rocketskates owners. You know, it is really interesting that we are living an age of “The Internet of Things”, so I suppose roller skates would get that treatment eventually. This is a Kickstarter project, and it has already met it’s $50,000 goal in two days. You can probably buy them for about $399-499.